There will be an SSTA presence at the STUC St Andrew’s Day March and Rally which is due to take place on Saturday 26th November 2016 in Glasgow. no later than the 24th November 2016 – joining details will then be forwarded. 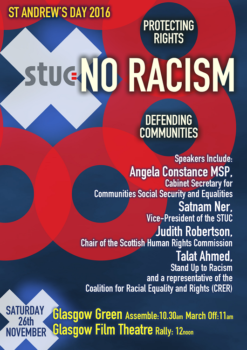 ‘No Racism: Protecting Rights, Defending Communities’.